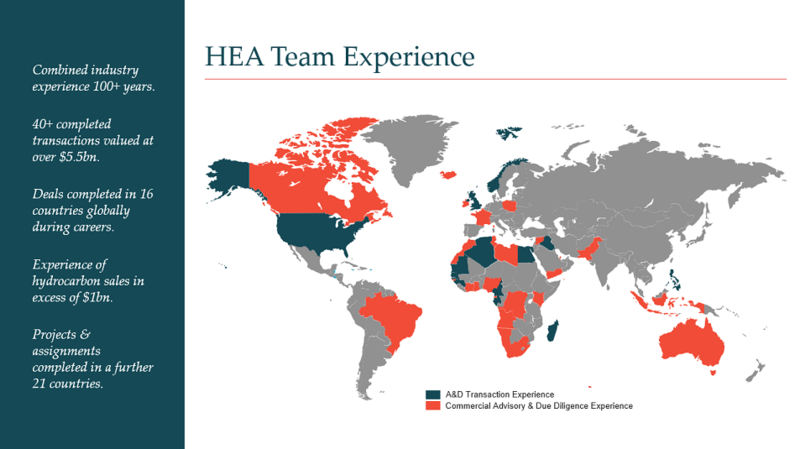 HEA brings together a team of energy professionals with 150+ years international experience from working with some of the largest global energy players. HEA have a core team of principals and advisors with a combined experience of over 100+ years having worked for some of the largest international energy companies including BP, ExxonMobil, ENGIE, TOTAL and Centrica. The team is supplemented by a number of long term contractor relationships in order to be able to size a team to fit any project small or large and match the right knowledge, skill and experience set to the right project. Our experience of different projects, countries and contexts, all with different challenges and objectives gives us a rich source of information and intelligence about what works and what doesn't work in different situations. Commercial analysis and negotiation support on the defence of an offshore transportation and processing agreement dispute. Divestment process for an onshore shale gas portfolio. Gas Sales marketing tender for a large gas development in the UKCS. Strategy Review project for E&P division of a major utility company. Acquisition advisory and strategy development for shale gas entry. Development of in-house Commercial Training Programme. If you are interested in discussing your requirements further get in touch here.